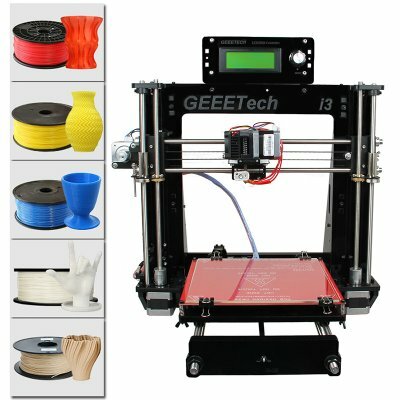 Successfully Added Geeetech Acrylic I3 Pro B DIY 3D Printer - Supports 5 Filaments, Large Printing Volume, High Precision to your Shopping Cart. Build your own 3D printer with the Geeetech Acrylic I3 Pro B DIY kit. This amazing DIY 3D printer kit comes with all the components needed to assemble your own 3D printer. Thanks to its accurate component list and guidelines, you’ll be able to install this beauty without needing any technological knowledge. If you are looking for a fun and affordable way to enter the world of 3D printing, this gizmo is perfect for you. It features a compact size which makes this printer great for hobbyists, artists, and small business owners. With this 3D printer, you’ll be able to create anything your mind can imagine. The Geeetech Acrylic I3 Pro B supports a wide range of filaments. Allowing you to work with ABS, PLA, Flexible PLA, Nylon, Wood-Polymer – it brings along plenty of possibilities when working on your upcoming art projects. The 3D printer supports different nozzle diameters– letting you choose the suitable thickness that fits the needs of your design. With a 200 x 200 x 180mm building volume, this 3D printer does not limit you to creating small objects. Thanks to its 0.1mm printing precision, it lets you build extremely detailed and well-finished objects. It supports different file formats such as G-Code that can be inserted through USB or SD card. Thanks to this, you’re also able to use your printer when it is offline. If you are looking for a cool and affordable gizmo that lets you create anything your heart desires, the Geeetech Acrylic I3 Pro B is perfect for you. Thanks to its simple to use design, this gadget can be operated by beginners and professionals alike. The Geeetech Acrylic I3 Pro B DIY 3D printer comes with a 12 months warranty, brought to you by the leader in electronic devices as well as wholesale 3D printers..